So a lot of times spin-off series fall somewhat flat for me. Either I'm so invested in those original characters that I have trouble shifting my loyalty as unswervingly to these previously side characters, or the story lines are just not as strong, or the genre shifts in a direction that just doesn't click for me as well, or what have you. But from the moment I picked up the introductory novella to Patricia Briggs' Alpha & Omega series, Anna and Charles were just in with me. And the three novels that followed only cemented that fact. It looked like we might not be getting another book for some time, which is why I was so thrilled to hear she'd gone ahead and written a fourth. 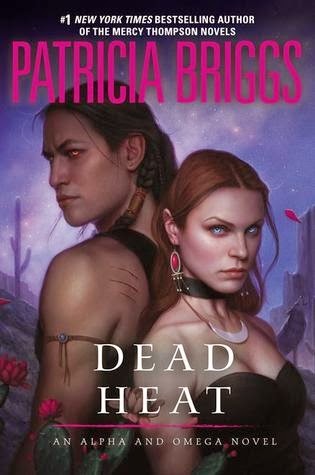 Dead Heat is due out March 3rd of next year, and when I saw the cover all I could do was squee. Because Charles in human form. And because fourth book in a series I truly love. You are so right! This is the first A&O cover with Charles in human form - didn't realise that before. I love the US covers so much for this series. So do I! I think this is my favorite one. I love Charles and Anna! And we finally get to see Charles in human form!This is one of my favorite series; I actually love the two of them as much as Mercy and Adam and that's saying something. the others she comes into contact with is just so cool! That really is saying something! And I understand completely. They had me from the first page.